Sometimes, you want to be able to set a start date for a piece of evergreen content. In SmarterQueue, this just takes a few clicks. First, you’ll need to choose the date and time you want your post to start recycling. 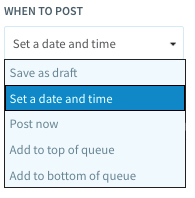 Click the drop-down menu under “When to Post.” Choose Set a date and time. You’ll then be asked for the specific date/time you want the post to start to publish. 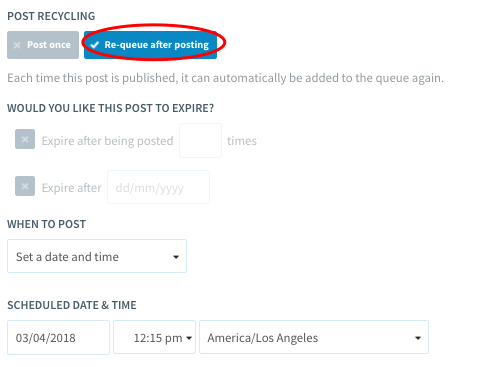 Under Post Recycling, choose Re-queue after posting.You can also choose an expiry date for your post, or retire the post after a set number of cycles. When your post is saved, it will publish at the time that you schedule and then be moved back to the bottom of the queue in the next available timeslot for that category/account.